If you have a large household with a never-ending stream of laundry, you’ll greatly appreciate the LG WT1701CW, which has a 5.0 cubic foot capacity tub. With that much space, you’ll find yourself cutting down on the number of loads—and saving water and energy at the same time. 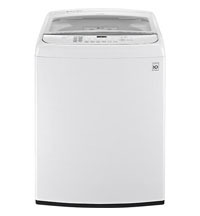 This LG model boasts a gently closing glass lid and 12 wash cycles that handle everything from bedding to wool. The only complaints we had were that the tub is so deep, it can be hard to lean over to reach the bottom, and the cycle times take a long time. But we were more than satisfied with its washing performance—clothes came out fresh and stain-free. Best of all, this model is available for as low as $768.99.